It was just a few steps. My daughter was one of 25 or so pupils who were being honoured at a school presentation evening. She and I were sitting in the first row, because we’d got there half an hour early. (I’d got the start time wrong because I’d accidentally read last year’s letter on my email instead of this year’s. My girl will definitely harp on about this until, possibly right up to and beyond next year’s event. Sometimes I am an utter idiot). All sixth form pupils from her special school (with some leavers from last term who had now gone on to college) were getting certificates. All have special needs of some description. Of many descriptions. All were getting recognition for passing various courses, from entry level English and Maths, to Land Management, and a plethora of subjects in between. All of them took a few steps up to the front of the hall to get a handshake, a posh folder, their certificates, and a round of applause. (Well, all except one, who couldn’t cope with standing up in front of a crowd, so was handed it while he hid behind a door). 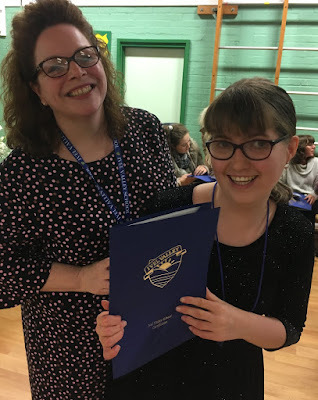 My girl got a couple of Retail unit awards and an Employability Skills award from her day release college course, plus Gold and Titanium Work Experience certificates, for her continuing placement at a local spa. She heard her name called, and stood up, awkwardly, shyly. She shook hands with the teacher, smiled for her photo, and clutched her blue folder. I looked at her face, and the faces of these kids, these kids I’ve seen grow up over the past few years, and I thought about how far they’ve come. It was way, way beyond a few steps.